Please choose the colour of the folding ruler. Please see furhter information under "Material". Folding Rulers are an important tool for craftsmen and carpenters, but also useful in every household. Therefore custom printed folding rulers are a perfect promotional tool. Just print your personal folding rulers with logo, a name or even a picture and you have a perfect and useable give-away for promotion. You can choose between wooden rulers and plastic folding rulers. The wooden rulers are the classic natural tool which is especially famous for carpenters. An advantage for plastic rulers is that they are water proof and therefore even suited for work under water. 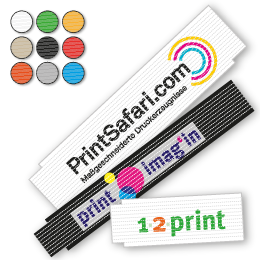 No matter which material you choose, the entire front and back is printable with a custom design, so you get custom printed folding rulers that carry your promotional message.